After the review, here you can read an interview with Pery (Satanismo Calibro 9, Cognac & Quaalude, Nerofosco, etc.). 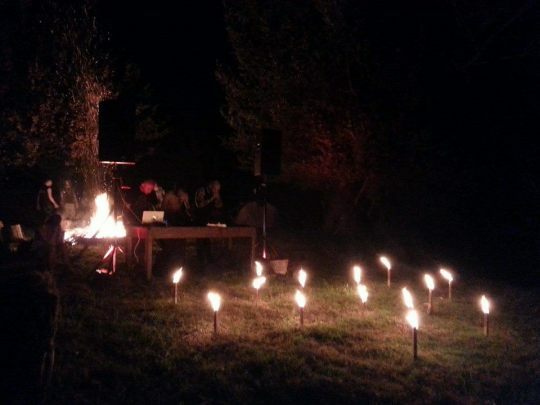 A good opportunity to learn a little more about the italian ritual noise project Shuar Lodge. L.O.S. : As you are a young project, can you introduce Shuar Lodge to us ? Who are the members? Why did you choose that name ? How do you work ? Pery : Dorian, singer of the shamanic doom band Caronte, is also a live promoter and his annual happening is a festival called Navajo Calling Fest. It usually takes place at the end of august on a hill near Parma. There’s a ranch, a small dark lake, trees and two stages. My main band is Satanismo Calibro 9 and he asked me to play during the 2014 edition. Not on a conventional stage, but on a small clearing between the trees on the lake shores. Tumulash (Fides Inversa and other bands) lit a big fire behind us, and also a lot of torches between us and the people. They were sitting around us in the dark, with flames as the only light and the dark water so close. We played for more than a hour in a supernatural atmosphere, a typical SC9 ritual. I drew the required seals and then burned them with our fires. When we stopped, we realized that something happened. It’s not simple to immobilize 200 standing individuals playing a ritual, but it happened. A lot of them reported about visions, lucid dreaming, apparitions and so on. I received messages for more than three months about that live show. During a little festival at the end of June 2015, Dorian asked me to play again, but obviously we had to set up something different. I litterally looked on my left side: Lorenzo Abattoir (Nascitari, Mare di Dirac and Satanismo Calibro 9) was there and I just said “I have the right person”. So we decided: the closing ritual would have been played by me, Dorian and Lorenzo. Between the end of June and the last week of August I created a small and rough structure and a full ritual, then we met on that hill. On friday night I consumed every drop of alcohol available falling in a devastating state of mind, and Dorian wasn’t so much better than me. Lorenzo reached us on saturday and few hours later we were setting up once more the lake stage. We never played together, so we just confirmed our roles: Dorian on ritual vocals, Lorenzo on both vocals and concrete noises, while I controlled all the machines. Tumulash lit the fire once more behind us, Tony (guitar player, Caronte) and Alex (a good friend) lit the torches and we just started. We recorded that show without any expectation. We just said “Let’s see”. And it was good. It was something different, not so structured like SC9. Something like a shamanic stone age ritual. Listening to it, we realized that a new project was born. We decided to call it Shuar Lodge considering shuar people as a symbol of true shamanic culture. 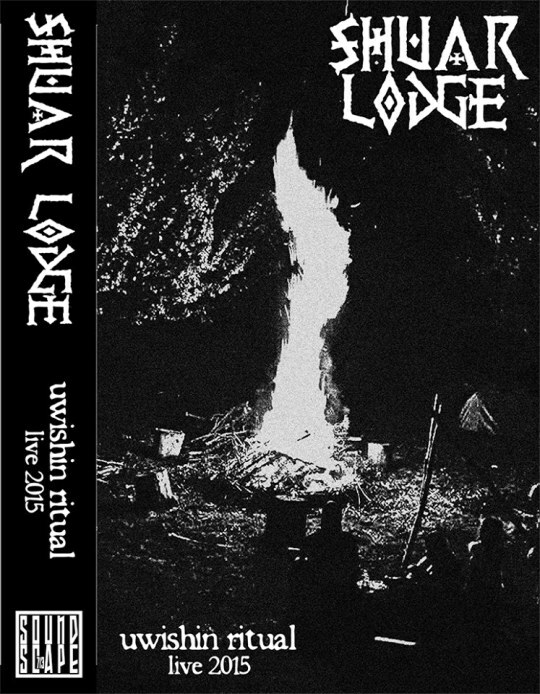 In a postmodern point of view we added the word “lodge”, showing our common interests in shamanism and esoteric themes. The live tape was a starting point and it’s sold out, so I think we are walking the right path. Anyway, we decided to start working on a real album, so I guess we’ll keep the same roles, but with a different approach. Your first release is a live tape, it’s quite unusual…Why did you choose to bring a live tape out ? I strongly believe that each live show must be unique. When I play on stage with SC9 I create a new specific ritual every time. Few shows in a year, but anyone can remember it. Shuar Lodge was born as a real live ritual, closing a festival. So it was something special. We captured the precise moment when Shuar Lodge was born. Don’t you think it’s something unusual and worthy of a recording? Your tape reveals a dark and noxious atmosphere but also with a mystical vibe…What is your main goal whith Shuar lodge ? What do you want to express ? It’s something dealing with altered states of mind, ancestral beliefs, something telluric and fluid. We do not have a specific goal. It’s more about subtle perceptions and ritual workings. According to you what are the main influences that lead your creativity? What are you going to plan for Shuar Lodge ? A new recording ? Other gigs ? A new recording, surely. About gigs, I can’t say if and when, but we want to play again live. Thank you for your time, I really appreciated. Going back to our primordial roots is the only way to understand and expand your self. By LawOfSun. Interview realized by exchange of e-mails between january 2016 and february 2016.